Post Your Best Find and Win! Thread: Post Your Best Find and Win! Treasurenet.com is hosting our first “Post Your Best Find” contest, and the grand prize is a brand new MX50 Metal Detector from Ground EFX. Post a photo and brief story about your best find, whether it be a coin, artifact, painting, baseball card…anything. The winner will be chosen at random. Post only one photo please. The grand prize will be shipped directly from the manufacturer to the lower 48 states only. All members in the lower 48 are eligible. Entries must be posted in the official contest thread to be eligible. Entries can be current or past finds, but must belong to the member posting. Any entries found to be fraudulent will be disqualified. Contest ends on July 15th, and the winner will be announced on July 17th. New Entry Level Digital Metal Detector! Grand Prairie, TX — Ground EFX™ offers a family of metal detectors that emphasize advanced, yet simple-to-use equipment and focuses on feature-packed models that lead to more treasure and less junk! Ground EFX introduces the STORM™ MX50 that incorporates basic technology for the entry-level hobbyist with economical value. The STORM™ Series of digital metal detectors deliver the latest revolution to the detecting world. The lightweight fiberglass and polycarbonate construction makes the STORM™ Series MX50 very durable and ideal for long hunts. The eight metal categories and adjustable discrimination, in conjunction with the three elimination modes, make it easy to detect coins, jewelry, relics and much more. The STORM™ MX50 is equipped with eight HD identifying audio tones for superior acoustic balance. The pinpoint mode provides signal strength and depth indicators to maximize target acquisition and identification quickly. The large, simple-to-use interface is visible in low-to-high light conditions. The quick release extension rod design adds up to 14” in length for all ages and heights of hunters, while the adjustable arm guard with strap is beneficial for layering in cold temperature treasure hunting. The 8” circular submersible coil can find treasure while eliminating trash and junk. The unit operates with (6) AA batteries and is backed with a 1-year limited warranty. About Ground EFX™: A brand under Synergy Outdoors established to provide reliable equipment that leads to more treasure and less junk, capitalizing the hunter’s time in the field. Building on “getting outdoors”, Synergy solved the need for feature-packed metal detectors at an affordable price. wicked, coinman123, ALDEEZ777 and 3 others like this. wicked, Loco-Digger, DeepseekerADS and 2 others like this. I was water hunting on the west coast of Florida and finding the usual stuff when I was about ready to call it a day. There was a very faint signal on my PI machine when I was chest deep in the calm surf. I marked the spot with my toe and set my scoop into the spot and started to dig. After the third scoop, the target was still in the ground. It was a bit difficult to dig while in chest deep water, but after the third scoop I was invested in this hole. It took a while to finally dig this out. When I did, it was a blob of hardened shells and such. It wasn't iron, so who knows, might be something good. I had to use electrolysis to get the crustacean off little by little. It was a slow process watching the ring emerge. Once free, the silver ring shined up nicely. Nobody, to date, has been able to identify the marks on the ring, other than to say it's silver, old, the stone is Onyx, and it was the result of non-modern jewelry making techniques. My favorite ring to date. Last edited by G.I.B. ; Jun 24, 2015 at 04:16 PM. Loco-Digger, DeepseekerADS, T.C. and 6 others like this. Loco-Digger, DeepseekerADS, CoilyGirl and 4 others like this. My best find was when I had cabin fever 18 months ago and stumbled onto T-Net. By reading many threads in the forums that peaked my curiosity I learned how to set up my detector I bought 3 years earlier and began my journey in this hobby. My best find with my metal detector was at the Brick House on 6/14/2015 when I dug the 1812 5 Francs coin. The road in front of the house was an old Indian trail. This may be the reason the coin was lost their since the town was not settled until 1818. The house on the property was built in the 1880's after it was sub divided from the lot owned by the people who lived next door. Went back to the brick house today hoping to pull some IHPs or at least something from the 1800's. I am running BOOST process and changed direction from (East to West) to (North to South). As soon as I got there, it started to drizzle. No fear, I won't melt. Within a few minutes it cut loose. I went to the van and got my poncho, a little rain was not going to chase me away. First target was the bullet. On my 3rd row I get a big hit next to the sidewalk. I dug down 8 inches, nothing in the plug. I pulled the pro pointer out and when I put it in the hole it was going off. Must be a little deeper. To make a long story short I pulled my 1st Big silver, and it's from the 1800's! An 1812 Napoleon Empereur 5 Francs coin. I am stiil stoked even though I dug it about 4 hours ago. The wife normally does not get excited regarding my hobby nor the finds, but she had to take a pic of that coin to send to her pops. Pulled 3 more wheats (1935, 1944, & a 1951-D. Only 2 memorial pennies. Last edited by Loco-Digger; Jun 25, 2015 at 06:43 AM. relic nut, DeepseekerADS, ALDEEZ777 and 2 others like this. Loco-Digger, DeepseekerADS, ALDEEZ777 and 3 others like this. My best find, early in my detecting hobby, has to be the WW1 military infantry ring that I found in an old yard in Ft. Myers, FL. The ring itself was designed by a jewelry firm called Ostby and Barton from Providence, Rhode Island. The back story is the Ostby fellow perished on the Titanic, yet his daughter survived. The World War saw doughboys returning from "over there", and rings were sold as commemorative keepsakes for their time in the service. A year after I was lucky to find it, a career Infantryman reached out to me, inquiring about its availability... turns out, it fits him perfectly. Thankyou for this great contest! Loco-Digger, G.I.B., DeepseekerADS and 3 others like this. My best find was while coin roll hunting nickels. I found the same die break error on the reverse of 2 2013's. Less than a year later I then found a similar break on the reverse of a 2012, possibly proving that the mint was using the same dies across years. My local coin dealer was dumbfounded but impressed. I still look at newer Jeffs hoping to find more of them. I received this in change last year. That delighted me more than digging one up! In change from the store! ALDEEZ777, Loco-Digger, Carolina Tom and 4 others like this. It is really hard to pick just one, however, I will go with my oldest dated coin. While detecting in Philadelphia, I was afforded the opportunity to hunt a house built in 1747. While hunting the front yard, near the walkway to the door, I got a nice solid high tone, dug a plug, and this beauty appeared. 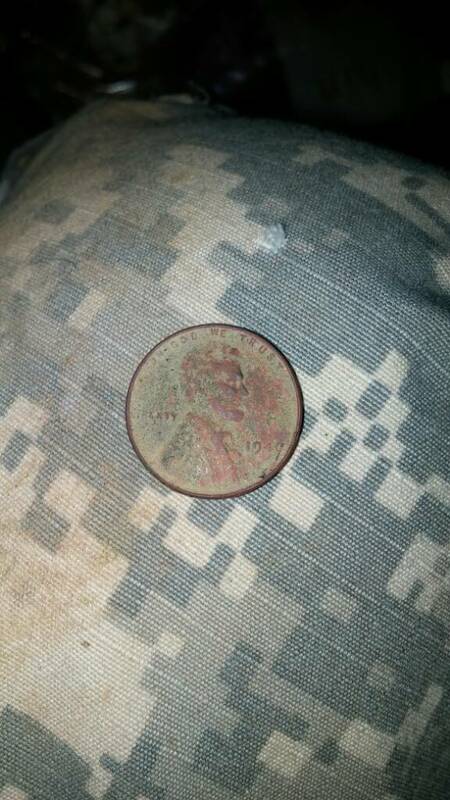 1837 large cent. G.I.B., ALDEEZ777, DeepseekerADS and 7 others like this. Knowledge in machine struck coinage and colonial through 1800's Relics. I have so many finds I think are great in my eyes, whether a crusty toasted copper or a cool button. I guess I will have to go with one that is really my "best" though. A pewter sundial made by famous mid 18th century pewter maker, Josiah Miller. A very similar sundial with a slightly different design is on display at Colonial Williamsburg and another one at the Metropolitan Museum of Art. Colonial Williamsburg even made some Souvenir Reproductions of the exact same sundial they have on display with Colonial Williamsburg's Mark on the bottom, I can't believe I have a sundial that some museum gift shop trinkets are based off of. I am going to put this find on loan at the local town museum in the next few days, and make an appointment talking about some of my finds and there context. Did I mention that I found it with one of my first detectors that I got in my first three months of metal detecting, from June 2013 to July 2013, it proves that it's not the machine that matters, it's what you do with it. If I did not pick this I would have picked my second place relic, my silver ornately designed monogrammed shoe buckle fragment, given as a gift on a special occasion. But I feel that the sundial is quite a bit better due to it's historical significance. Last edited by coinman123; Jun 25, 2015 at 08:56 AM. Loco-Digger, Carolina Tom, ALDEEZ777 and 7 others like this. This is definitely not my most valuable find but to find a pin this old with the picture still so visible really made me feel closer to the history of my home town. ALDEEZ777, relic nut, Loco-Digger and 7 others like this. Last edited by coinman123; Jun 25, 2015 at 06:18 PM. Joe hunter and ALDEEZ777 like this. That's one awesome find. Personal items like that are hard to top. If in my collection it would be priceless. This would get my vote. I was on a tot-lot tour after work a few weeks ago, and was really hitting the "nothing." After 4 tot lots and only pennies, I was just about to give up, but decided to literally head "outside the box," and detect the grassy area around the tot lot under the trees. I was about 3/4 of the way around, having dug at least a dozen pop tops, and I got an erratic signal. I was sure it was trash, but since I'd already had a bag full, I stopped and dug it. As a rule of thumb if I have erratic signals, I always dig on the side of the target that has none (in case it's a chain or necklace). Wow, was I surprised when I unearthed the silver cross with gold accents. My habit totally paid off, too, as the silver chain trailed off into the grass roots above where I had dug. It took a good minute or so to untangle from the roots, and I simply put it into my pouch, thinking it was costume jewelry. Still, a fun find! The next day, when I got around to cleaning the dirt off of it, I was totally surprised to see "925" and "12K" stamped in the back of the cross! A quick search revealed I had a silver "antiqued" cross with Black Hills Gold leaves. Love it! ALDEEZ777, Joe hunter, Loco-Digger and 2 others like this. By Lost&Found in forum Garage Sale Finds! By Badfrog in forum Today's Finds! By Pentico in forum Today's Finds! By groundfishin in forum Today's Finds!